Architect Philipp Mainzer has transformed an old mill in Eigeltingen, Southern Germany into a working distillery complete with tasting areas and a showroom for award-winning spirits producer Stählemühle. The dormant building been had been used at one time as a schnapps distillery, but when former art publisher Christoph Keller came across the structure, he enlisted help to revive the space to manufacture his own organic brandy and gin. 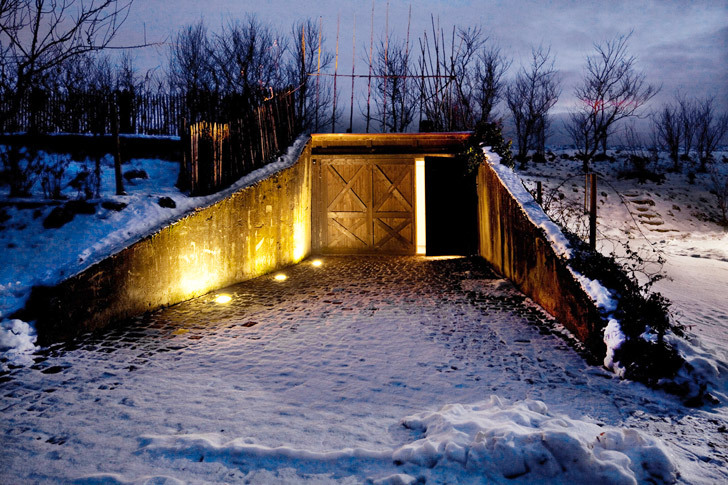 Behind the rustic doors of the old Stählemühle mill now lie sleek, dramatically lit minimal rooms with exposed concrete walls and simple wood furnishings. Mainzer describes his creative intent as seeking to put “specified traditional materials in a modern context” – he incorporated industrial materials that contrast with the polished finish of the large, elegant copper distillation machine. The custom-made wooden furniture pieces throughout the space were crafted by design firm e15. Perhaps the most eye-catching room in the converted mill is the one in which the Stählemühle spirits ripen. 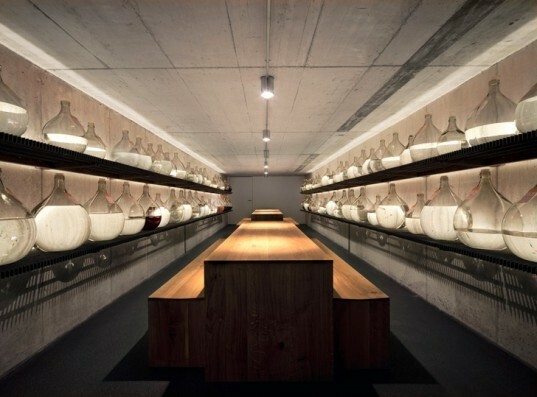 In keeping with founder Christoph Keller’s approach—as one viewing liquor production as a combination of alchemy and tradition—the space is lined with large orb-like bottles in which the spirits sit for anywhere between three months and five years. The bottles act as lenses, reflecting the soft light around the windowless industrial room. Each of the bottles is delicately adorned with an individual handwritten label. The minimal, meditative spaces of the distillery also support Keller’s emphasis on reawakening one’s senses and memories through taste. The incredible transformation of the space, accompanied by Keller’s purist, organic approach to the production of alcohol is perhaps marred only by some of the choices in building materials — the minimal industrial floors are made from asphalt. Behind the rustic doors of the old Stählemühle mill now lie sleek, dramatically lit minimal rooms with exposed concrete walls and simple wood furnishings. Mainzer describes his creative intent as seeking to put "specified traditional materials in a modern context" - he incorporated industrial materials that contrast with the polished finish of the large, elegant copper distillation machine. Perhaps the most eye-catching room in the converted mill is the one in which the Stählemühle spirits ripen. In keeping with founder Christoph Keller's approach—as one viewing liquor production as a combination of alchemy and tradition—the space is lined with large orb-like bottles in which the spirits sit for anywhere between three months and five years. The bottles act as lenses, reflecting the soft light around the windowless industrial room. Each of the bottles is delicately adorned with an individual handwritten label. The minimal, meditative spaces of the distillery also support Keller's emphasis on reawakening one's senses and memories through taste. The custom-made wooden furniture pieces throughout the space were crafted by design firm e15.